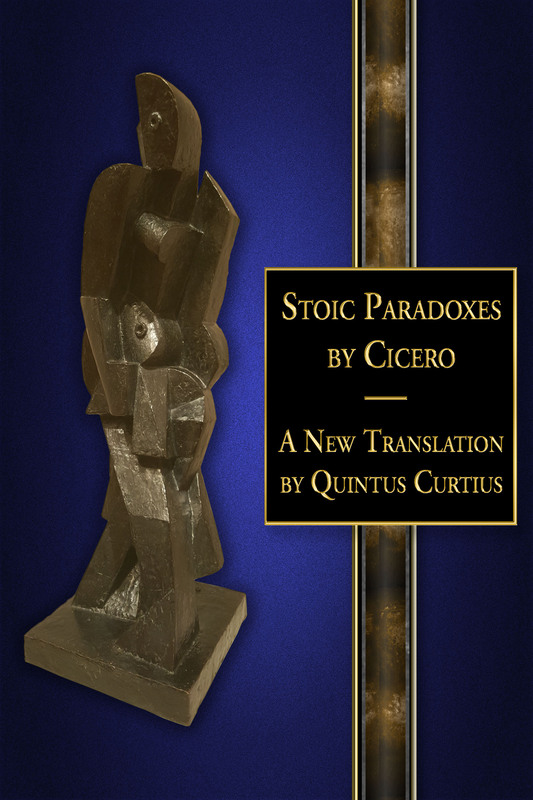 This fall, I will be releasing a translation of Cicero’s Stoic Paradoxes. The book deals with some of the major questions on life and conduct that every man must confront. The book came about in response to the many questions I received asking for good introductory texts on Stoicism. I feel that this little book is a very useful preparatory work in the subject. I have produced a modern and accessible translation of this work. There will also be separate chapters on the life of Cicero, the history of Stoic thought, and a detailed synopsis of the text. These extra materials help frame the work in proper context. The text is entirely annotated for ease of comprehension, and an index is included. An additional bonus feature includes Cicero’s brilliant imaginative essay The Dream of Scipio, surely his most visionary piece of writing. It summarizes his transcendent belief in life after death. So this man is lauded as a leader, or called one, or is thought to be worthy of the name: but a leader in what way? Will he order around a free man, this person who cannot even control his own passions? He should first contain his own libido, reject excessive pleasures, keep his irascibility in check, restrain his greed, and ward off all the disgraces of the mind. Only then may he begin to issue orders to others, when he has stopped obeying the most unworthy masters of moral turpitude and bad judgment. While he remains subservient to these masters, he can be neither a commander nor even a free man. Excellent is the saying taken from the most learned (whose authority I might not here use if I were made to make this oration to a group of country bumpkins): but since I speak here before the most refined types of people, to whom these things are perceptible, why should I pretend that I have wasted the time I placed in these studies? It is said by the most educated of men that no one is free except for the wise man. But what is freedom? It is the power to live as you wish to live. The man who really lives is the man who wants nothing except to follow the right path; who finds satisfaction in his responsibility; whose way of living is well-considered and provided; who follows the laws not out of fear but follows and defers to them because he judges them to be most conducive to the collective health; who says nothing, does nothing, and thinks nothing except what is free and volitional; whose every plan and action which he does, all follow from this and are traceable to this; and there are no other things which dominates him more than his own will and power of judgment. Fortune herself submits indeed to whom is said to have the greatest power. As a wise poet said, Fortune herself is attached to each man according to his habits. Therefore it is granted to the wise man alone that he do nothing against his will, nothing that he may regret, and nothing that is forced on him. And although this ought to be addressed with additional argument, this is nevertheless a concise and confessed truth, that the only truly free man is he who is imbued with this attitude. All bad men are slaves, I tell you, slaves! This is hardly such an unexpected and wondrous saying. For they are not considered “slaves” in that they are pieces of property that have been made so by attachment of their masters or by other civil law; but if servitude is, as I see it, the blind obedience of a broken and demoralized soul, lacking its own free will, who would deny that all superficial people, all covetous people, and finally all people of bad character are slaves? Or can I consider that man “free” who takes orders from his woman, on whom she imposes rules, on whom she proscribes, forbids, and commands as she likes, who can deny nothing that she commands, and never dares to contradict her? If she issues an order, it must be done; if she calls, he must come running; if she tosses him out, he has to go; if she threatens him, he must live in fear. I certainly consider such a man not only a slave but the most worthless kind of slave, and even if he were born into the most respectable family, I would still call him so. And as in a large family there are servants who are more exalted than the others—but are still servants and remain so—such as the porters and gardeners, equally foolish are those who amuse themselves with statutes, paintings, embossed silver, Corinthian art works, and gargantuan buildings of gaudy appearance. “We are,” they say, “the notables of the state.” You are neither the notables of the servant class nor your own class. But as in a family, those who handle these things (who wipe away dirt, who oil, who sweep, or who water) do not hold the most prestigious rank of servant; so in the political sphere, those who have given themselves over to unshakeable greeds often occupy the lowest rank in the world of servitude. I look forward to discussing this work, and others, with you in the months ahead. Looking forward to the publication! It’s hard to find a better Roman writer/speaker than Cicero. The passage you quoted above is strikingly relevant in today’s world. Thanks much, brother. I get more questions on Stoicism than any other philosophical school. This will be the first time that the work is treated as a complete, separate book. And it’s the first published translation since the early 1940s. So, there is a real need for this. Plus, I’ll be adding a lot of extras (extra essays, commentary, index, and “Dream of Scipio”). Stoic philosophy can be hard to digest at times. The last really good stoic book I read was Marcus Aurelius’s “Meditations “(Dover Thrift translation). I am looking forward to your translation of Cicero’s work.